People of all ages can benefit from DMT. Dance experience is not necessary. DMT can open doors to feeling more at home in your body. It is especially valuable to people where trauma, injury or illness has impacted the body and or the sense of self; for example people dealing with? eating disorder, mental health issues including addiction, anxiety, depression and needs for recovery from violence. The creative and spontaneous aspects of DMT provide a natural modality appropriate to the developing body-centred child and adolescent (presentation). Example: Children with autism, emotionally distressed children, children with learning challenges. DMT also is useful in working with the elders in our community to reignite their joy in movement. Other communities that can be supported by DMT include managing men looking at men’s issues, intercultural communities, issues of diversity, and sexuality and sexual identity can also be worked with through DMT. Dance movement therapy is most recently being applyied to engaging with the environment, and city challenges. Working with enviromental issues in urban and rural spaces. Dance Movement Therapists are trained to Master’s level and are accredited by IACAT. They carry out assessments, plan, implement and evaluate DM-based therapy interventions to work with specific populations. Dance and spontaneous movement have always been used to promote healing, express feelings, and negotiate spirituality. This ancient practice is transcultural. However DMT as a form of psychotherapy began in the United States in the 1940s initially in state psychiatry where Marian Chace used her knowledge of the body as a dancer as a form of communication. By perceiving the de-synchronisation of the body with compassion she was able to relate to isolated communities. Using mirroring , shared rhythm connection between self and other was invited. Meanwhile another pioneering Dance Movement Therapist Mary Whitehouse worked with normal populations to support them to integrate complexes through working with the body as a way to make a connection between the known and the unknown. Mary explored movement from habit moving versa being moved by a deeper intelligence. DMT in Ireland has been initiated by therapists trained in the USA, England, and Spain. Dance as a healing art and as a method of health education emerged in Ireland in the 1990’s in the Western Healthboard through Bernadette Divilly. Dance Movement therapy was pioneered in the Health Services with children with disabilities and in health education then in the Northern Health Board by Fran Burns. 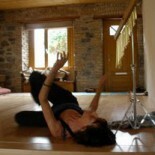 Currently Dance Movement Therapists in Ireland work in private practice, research and publishing and community settings. They have very varied and diverent careers as they creat opportunities for their own employment. The Health Services are using DMT as an element of integrated approach to work with mothers and babies at risk for developmental delay. Pre and peri-natal psychology and mindfulness practices are developing with virgour as evidenced by the first Irish based Somatic Education training Orgins developed by Joan Davis on the east coast of Ireland. Life is Dance: The art and science of dance movement therapy. New York: Routledge Press. An Introduction to Medical Dance/Movement Therapy: Health Care in Motion.